THQ and Relic Entertainment released the real-time strategy game Company of Heroes in 2006, and it quickly became one of the highest-rated strategy games of all time. set during World War II, Company of Heroes featured dynamic maps with destructible terrain and structures, authentic units and an innovative cover system. Now we know that Relic is exploring the Eastern Front in early 2013 with Company of Heroes 2, and they want to make it authentic. We know that because THQ recently revealed ColdTech, their special way of bringing the harsh Russian winter of WWII to life. The temperature reached extremes of -41 degrees F in 1941, extremes which quickly become deadly if you're exposed for even a few minutes. The threat of the elements is portrayed in Company of Heroes 2 as an environmental hazard; units out in the open will quickly freeze to death if left out in the cold. Combatting the weather requires physical shelter or fires that can be set up by battlefield engineers, making them a vital unit to add to your squad. Dynamic blizzards will also appear, making it even more dangerous to get caught out in the cold. Troops trudging through the snow will also have a hard time moving, becoming slow and easy targets. Also, a new dynamic the snow introduces is the use of tracks: when troops or vehicles move through the snow, they leave distinct tracks that another player can easily identify. These physical records may make it tough to keep the strategic edge of surprise when enemy scouts can see right where your units are heading. Luckily, when new snow falls it covers everything from tracks to vehicles to structures. Plays will also be able to melt and remove snow, helping movement and opening new paths. Finally, ColdTech introduces ice-covered lakes that can become strategic points. Icy lakes hinder vehicle and troop movement due to their slippery surface, but more importantly, they can crack. 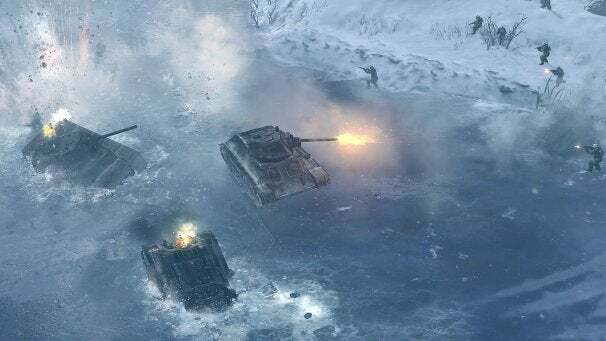 A well-timed attack could send an enemy squad and a couple tanks through the ice into the water, quickly killing them via hypothermia. After a while the ice will reform due to winter conditions, leaving no trace behind. The game looks fantastic, and the new mechanics make the gameplay deeper than ever. Coordinating attacks while surviving the winter will take constant decisions that could leave an army defenseless, dead and defeated. Seems like if you can't keep up with Mother Nature, your winning edge could disappear through a crack in the ice. Follow them on Twitter for news and updates. Check out the trailer too!